Stuart Hall held on to his IBF bantamweight title after his fight with Martin Ward ended in a technical draw following an accidental clash of heads early on. Hall was making the first defence of the world crown he won in December last year, but the bout at the Metro Radio Arena in Newcastle was prematurely stopped in the second round. Ward sustained a nasty cut above his right eye after the pair collided in the opening three minutes and the challenger's bid was halted just after the second round had got under way. With the clash lasting less than the four rounds needed to be an official contest, a technical draw was declared, meaning Hall retained his title but perhaps not in the manner he would have wanted on an anti-climactic night in the north-east. Hall, who took his record to 16 wins, with two draws and two defeats, admitted he was disappointed with the result, having shaded the first round in a contest between two north-east fighters. 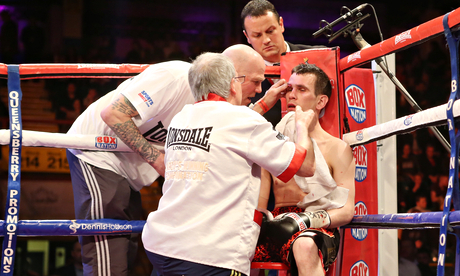 "I'm gutted how it's turned out, the crowd have been robbed of a great fight," the 34-year-old from Darlington said. The champion started in positive fashion but connected heads with Ward after leaning forward to land a right hand. According to reports, Ward said he needed 10 superficial stitches for the wound. The 26-year-old from County Durham told BBC Sport: "Stuart came with a right hand and as he rolled around he caught me. The saddest thing is the fans didn't get to see the fight but it happens in boxing. Neither of us proved what we wanted to." On the undercard, Frankie Gavin retained his Commonwealth welterweight title after recovering from his first professional knockdown to beat Sacky Shikukutu by a unanimous decision. The 28-year-old southpaw was floored by a left in the second round by the Namibian but beat the count and boxed cleverly thereafter to win on all three judges' scorecards and improve his record to 19 wins with no defeats, including 12 knockouts. The former Olympian Bradley Saunders maintained his unbeaten record with a ninth win – stopping Mitch Ward with three knockdowns in the fourth round.